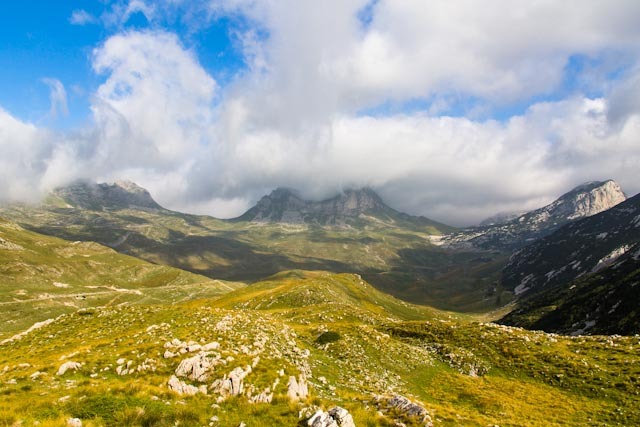 This beautiful mountain range is situated in the north-western part of Montenegro. Durmitor national park is surrounded by deep valleys and canyons from three side, on the north by the second deepest canyon in the world and deepest in Europe the Tara canyon, on the west by the canyon of the Piva river and Pivska Planina mountain range , and on the south by the Komarnica canyon. 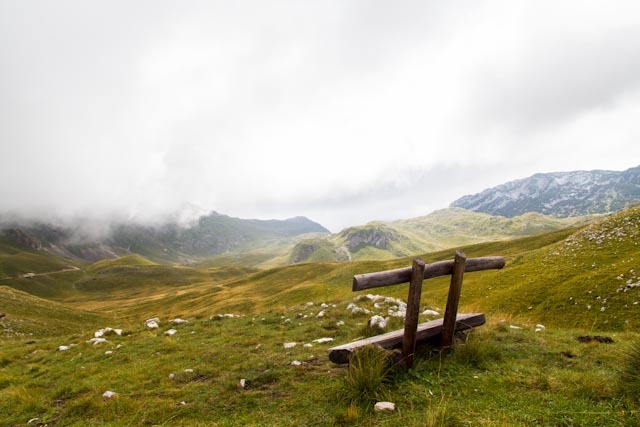 On the east Durmitor is an open huge vast grassland plateau called Jezerska Povrs (Plateau of Lakes), which end is on the beginning of the Sinjajevina mountain range. Whole national park is 39.000 hectares big. 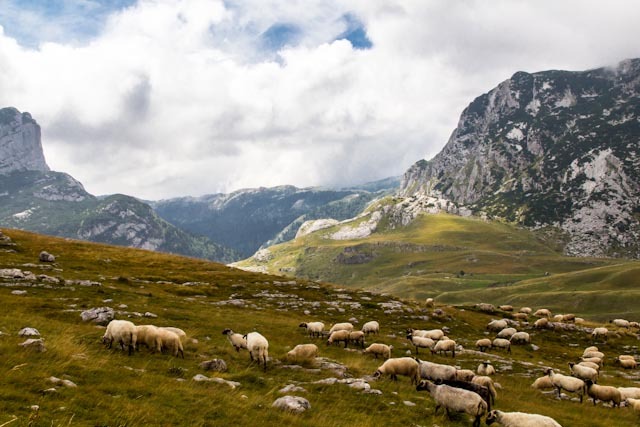 The main features of the Durmitor region is the Jezerska Povrs vast plateau 1500 meters above sea level intersected by deep canyon gorges over towered by impressive mountain peaks, of which 48 are over 2000 meter (27 over 2200 meter). The highest peak of the massif is Bobotov Kuk (2523 meter). There are 18 glacial lakes at heights over 1500 meters adding great charm to the Durmitor massif. Durmitorians called them “Gorske Oci” (Mountain Eyes). Also, Durmitor have 748 springs of pure mountain water and forests in which some trees are more than a few hundred years old. Along its 2000 km of climbing and hiking trails you can find many caves, such as Ledena Pechina (Ice Cave, below Obla Glava peak) and the cave on Vjetrena Brda. Among the most beautiful features of the national park are the sparkling waters of the rivers, carved into amazing canyon valleys. After glaciation in last ice age, during melt of ice, Durmitor’s lakes was born. Montenegrins and specially Durmitorians call them Gorske Oci (Mountain Eyes). They are located all over the Durmitor mountain range and Jezerska Povrs . These “Mountain Eyes” contributes very much to the beauty of the Durmitor national park. Durmitor’s lakes are the trademark of Durmitor’s famous beauty. Durmitor have 18 glacial lakes at heights over 1500 meter adding great charm to the Durmitor massif. The foundation for scientific research of lakes on Durmitor was given in the far away year 1899 by Jovan Cvijic who, during his visit, called on all its lakes. He stated that this lakes left an indelible mark and are the element of recognition for this Mountain, because nowhere, in the whole wide world, there is no such abundance of lakes in such a small territory. All of this lakes are different according to magnitude, quantity of water in them, shape, origin, quality and beauty of landscape surrounding them. The Tara river is exceptionally beautiful, by its impressive currant, depth and landscape of the canyon, making it one of the most stunning in the world. The richness of its flora and fauna, the complexity of its ecosystems, with over 1300 varied plant species, making it an exceptional concentration of such a quantity and quality of numerous endemic and ancient species, that Durmitor has extraordinary natural wealth that is a permanent inspiration to scientists and nature-lovers alike. The origin of the name “Durmitor” is not cleared with any certainty. According to some the origin of the name is Roman. Possibly it is derived from the latin word “dormitorium” i.e. from the italian word “dormitorio” or “dormire”, meaning “sleeping” because, according to legends the soldiers of the roman legions, marching by, were asking “is this Mountain sleeping?” Of course, there is a far less romantic explanation, possibly much closer to the truth, that the name was given by celtic tribes, the celtic: “dru-mi-tor” meaning “water from the mountain”. In any case the name was inherited by Slav tribes coming into the territory, the locals are stressing the word “Durmitor” on the second syllable. Durmitorians called Durmitor mountain as “Soa Nebeska”. Meaning, Durmitor peaks are so high that they touch the sky. 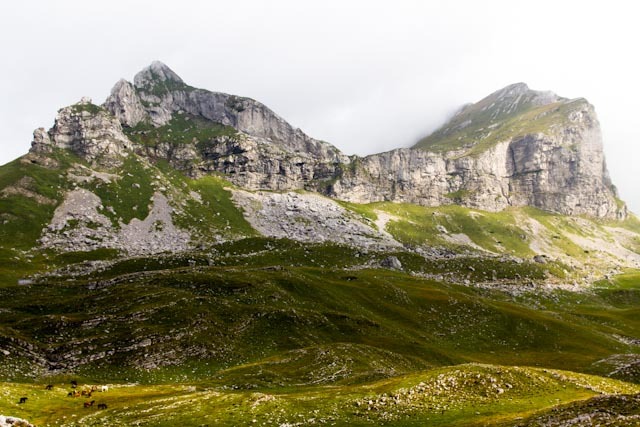 From all peaks of Durmitor massif three are most visited and most popular for climbing, Bobotov Kuk (2523 meter), Prutas (2393 meter) and Medjed (2287 meter). Medjed (2287 meter) summit view is something special. From the top of Medjed peak you can enjoy in amazing view to whole massif of Durmitor, above wonderful, the impressive and deep Lokvice valley. Also, you can see Crno Jezero from above. The best view off Crno Jezero is from Mali Medjed (2223 meter) summit. Prutas (2393 meter) summit view is really incredible. Beauty of this view is simply breathtaking. From Prutas summit you can see main crest of Durmitor massif (Soa Nebeska), which include the three peaks, Bezimeni Vrh (2487 meter), Bobotov Kuk (2523 meter) and Soa or Djevojka (2440 meter), and above the beauty of the Skrcka lake valley. Also,the beautiful Susica canyon can be seen from here. From Bobotov Kuk (2523 meter) summit, the highest peak of Durmitor, you can see in good weather conditions many mountain peaks in few countries, far some hundred kilometers away. With it’s two beautiful and picturesque lakes and impressive peaks which surrounded it’s devine beauty, Skrcka lake valley is for sure the most beautiful valley of Durmitor. In the last Ice Age basin of Skrcka was heavily glaciated and glacier was moving towards the canyon of Susica on the northwest. Skrcka occupies the southwest corner of central Durmitor. Valley is around 2.5 kilometer long while bottom is up to 1 kilometer wide. From all but the northwest side, where is the opening of the Susica canyon, Skrcka is closed by high and wild sides. And all three sides are specific, having different configuration. On the north and east is the main crest of the massif. That side is between 600 and 800 meter high. The highest side of valley is about 800 m high wall of amazing Soa Nebeska crest, created by three peaks, Bezimeni Vrh (2487 m), Bobotov Kuk (2523 meter) and Djevojka (2440 meter), placed on the northside of the valley. Skrcka valley has two beautifully lakes. Veliko Jezero (1686 meter) (Large Lake) placed in the middle of the valley. It is 580 meter long and up to 165m wide, 17m deep and has 1720 meter long coastline. Malo Jezero (1711meter) (Small Lake) is rounded and located below the cliffs of beautiful Prutas (2393 meter ). It is 225 mete long and up to 94 meter wide, 15meter deep and has 440 meter long coastline. Between the lakes is grassy plateau on which the Skrcka mountain hut (1723 meter) stands. Looking to the massif of Durmitor from Zabljak, Lokvice Valley is the second valley from the left, after the Velika Kalica valley. Lokvice is surrounded by many high peaks of Durmitor as are Bandijerna (2409 meter), Terzin Bogaz (2303 meter), Medjed (2287 meter) and Cvorov Bogaz (2152 meter). Through this valley leads many marked paths to the main peaks of Durmitor. The bottom of Lokvice is split in two parts by a small hill. North of it is Male Lokvice (Small Lokvice) while south of the hill is Velike Lokvice (Large Lokvice) with the Vir u Lokvicama (1693m) lake. On top of the hill is Lokvice Katun with few small shepherds houses, common place for camping. Lokvice is approached by the marked path from Crno Jezero and from Ivan Do camp. At Lokvice Katun marks split as one path leads to Velika Previja pass (Medjed, Terzin Bogaz, Velika Kalica direction) while the other path leads towards Bobotov Kuk, Bezimeni Vrh and Minin Bogaz, going through Biljegov Do basin and Valoviti Do basin. From all of valleys of Durmitor, Velika Kalica is most similar with wild high Julian Alps valleys. Bottom of this former glacial valley was most torn by its glacier. When you looking at the wild limestone cliffs of Sljeme, you can imagine that you are in Julian Alps. Like the nearby Lokvice valley, Velika Kalica stretches in south north direction. Sedlena Greda (2227 m) ‘Saddle of Gods’ peaks. On the east is the Terzin Bogaz (2303 meter) – Medjed (2287 meter) crest, connected by the Velika Previja (2145 meter) pass. From the south and east the valley is closed by the huge wall of Sljeme (2455 meter) which dominates on its southeast side. On the northern end of the wall is Savin Kuk (2313 meter). His wall is between 300 and 400 meter high. On the westside of Velika Kalica, below the northern side of the high Sljeme wall, a large snow field or snow slope is placed called Debeli Namet , that’s the remnant of the former glacier. Valley is only open on the north where over the Struga pass (1920 meter) you can descent towards the Crno Jezero lake. Marked path from Crno Jezero lake leads through Velika Kalica valley, from where you can climb to Terzin Bogaz (2303 meter), Veliki Medjed (2287 meter) and Mali Medjed (2223 meter). From Struga (1920 m) pass, which makes the beginning of the valley, marked path leads to Mali Medjed. At the end of the valley, on a small grassy hill by the Debeli Namet snow field, you can find a Bivak refuge (2020 m). From it the only way which going out of the valley lead to Velika Previja (2145 meter) pass. From the pass marks go left to Terzin Bogaz (2303 meter), right to Medjed (2287 meter) or straight down into the Lokvice valley. Alisnica Valley is most western valley of Durmitor. Together with Dobri Do valley, Velika Kalica valley, Lokvice valley and Skrka Lakes valley, Alisnica contribute to the beauty of Durmitor. Alisnica Valley is placed in western part of the massif. The Long valley of Alisnica creates a two part of valley, Donja Alisnica (Lower Alisnica) and Gornja Alisnica (Upper Alisnica). Whole Alisnica is very beautiful and has many breathtaking sceneries, for example the wild horses running on the green grassy plateaus of the valley. Through Alisnica is going the marked path to Planinica (2330 meter, Bezimeni Vrh (2487 m), Rbatina (2401 meter) and Skrcka valley (1723 meter). Bezimeni Vrh and Rbatina can be reached across Velika Struga (2274 meter) pass. In any case, people mostly going through Alisnica valley to reach the summit of Planinica, which is one of the most beautiful viewpoints summit of Durmitor. In Gornja Alisnica you can find the Lokve ponds. Most impressive scenery from Alisnica valley is view to the northwest-side of the amazing Bezimeni Vrh peak and Velika Struga pass on it’s left side. According to the laws governing national parks in Montenegro, in order to preserve the natural resources and cultural heritage of the parks, no new projects can be launched. Exception for this is only for existing foundations on which a new project can be realized. For the Durmitor park, this means that the park has almost no accommodation in it. 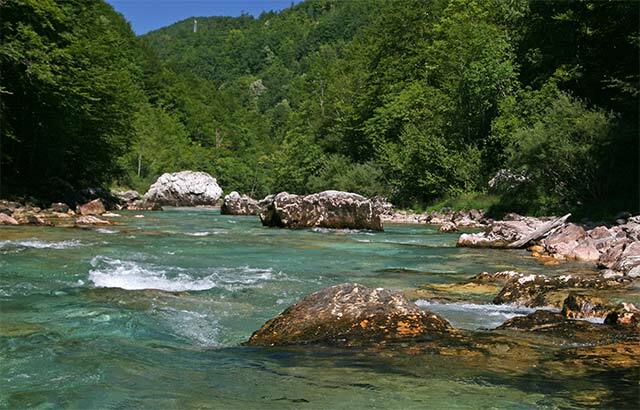 The accommodation in the park that can be found is mainly on the road going from Zabljak to Plevlja that’s crossing the Djurdjevica bridge.This is a beautiful part of the park regarding this part of the Tara river, but the higher peaks of the park are more western. 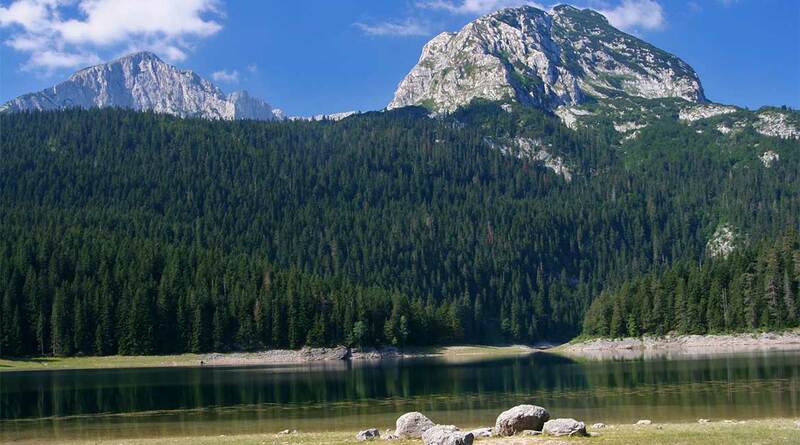 For this, you are best advised to visit the city of Zabljak, where most of the accommodation is located in this region. Zabljak itself is just outside the park and is within walking distance of three kilometers to the actual entrance of the national park. Motel Tara MB – The Motel Tara MB is located close to the the famous Djurdjevića bridge that’s crossing over the Tara River in the Durmitor park. It is located on the quiet road that lies through this part of the park. The motel also features a garden with panoramic views of the Djurdjevića bridge and the canyon. Distance – Located in the park. Facilities: Bar, Restaurant, Free parking, Free Wi-Fi, Terrace, Breakfast, Pets allowed. Guest House Tara Canyon – Guesthouse Tara canyon is set in a natural tranquil setting and all rooms offer views of the surrounding mountains. You will find a garden with beautiful views, a barbecue and a terrace. It is worth mentioning that the adventurous zipline that runs across the Tara ravine is located here. Ski hotel – Ski hotel is a small 4-star hotel 500 meters from the city center in a location with a beautiful view of the beautiful peaks of the Durmitor Mountains. The hotel offers 17 luxuriously appointed rooms and suites. Ski Hotel is 5 km from Savin Kuk Ski Area. Distance – 0.5 km away from the city center. Facilities : Indoor swimming pool, Free parking, Swimming pool, Sauna, Massage, Terrace, Skis school, Free Wi-Fi, Restaurant (à la carte), Breakfast in the room, Bar, Ski storage room. Hotel Javor – Hotel Javor features its own national eco-cuisine with specialties from the Durmitor region. It is located in the center of Zabljak, making it easy to find various restaurants, bars and supermarkets. The hotel is 500 meters from the Javorovac Ski Center. Distance : In the city center. Facilities : Free parking, Terrace, Ski school, Gratis Wi-Fi, Restaurant (à la carte), Breakfast options, Bar, Ski storage room, Barbeque Facilities. Šepić Accommodation – Šepić Accommodation is located in a quiet area 400 meters from the center of Žabljak. There is a seating area or a dining area in some of the holiday homes. Some homes also have a kitchenette equipped with a fridge. A private or shared bathroom is provided. Crno jezero is 2.8 km away. Distance – 0,4 km away of the center. Facilities : Free parking, Terrace, Free Wi-Fi, Garden. Villa peaks – Villa Peaks is located in the center of Žabljak, with various restaurants, cafés and shops in the area. The property has its own cooking facilities and other amenities. The property is 2.6 km from Crno Jezero and 3 km from the Savin Kuk ski lift. There is also a garden, barbecue facilities and a terrace. Distance – 0,2 km away of the center. Facilities : Free parking, Terrace, Free Wi-Fi, Garden, Barbecue Facilities. Hostel Highlander – Colorful hostel, with a natural look through the use of a lot of wood. With nice view of the wooded area and surroundings. The hostel serves authentic national Montenegrin cuisine. Facilities : Free parking, Terrace, Free wife, Garden, Barbecue Facilities, Pet’s allowed, Rental of ski equipment, Bike rental, Ski storage room, Ski school.